Infused with natural lavender scents, the Masters of Mayfair Sleep Mask is the ideal gift for anyone who struggles with not getting enough sleep on long-haul flights. The mask itself is made from silk for added comfort and features an elasticated strap with adjustable sizing for a perfect fit. One of the worst parts of travelling is having to queue for hours to get through security, but with CLEAR you can now speed through security in five minutes or less. Using only biometrics such as your eyeris and fingerprints, with a tap of your finger and a scan of your boarding pass CLEAR can enable you to coast through security with absolute ease. 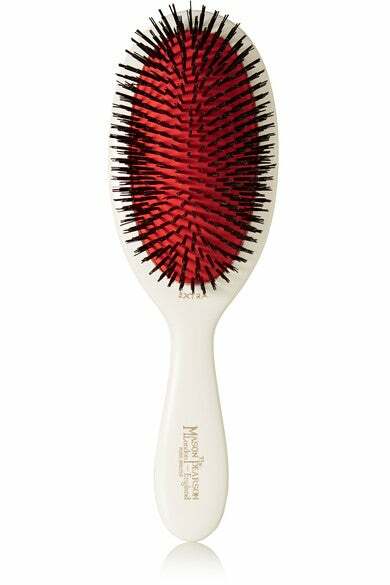 Small enough to fit in a make-up bag (or washbag), this Mason Pearson hairbrush is maybe the world’s most perfect brush, but what else would you expect from a company who’ve been manufacturing them for over 100 years? Handmade in England, the brush features bristles made entirely from boar. While this may sound a bit odd, the boar bristles help stimulate folicles and promote growth, on top of keeping your hair neat and tidy. With the signature Tom Ford logo subtly tucked inside, this alligator-clad passport holder is refined enough to travel with you around the world. The chic design is made in Italy from genuine alligator, in the quality that one has come to expect from the brand’s namesake (a former creative director of Gucci and Yves Saint Laurent). Known as “the most powerful app on your phone,” Velocity Black is a members-only concierge service for the digital age. Whether it’s a flight, restaurant reservation or concert ticket you’re after, the team is available 24/7 to get you access to members-only events and on-demand travel around the world. You won’t have to wait for your next exciting experience — responses are guaranteed within one minute. Two iconic brands come together on this gorgeous luggage line, evoking classic elements of both Tiffany and Globe-Trotter. In trademark Tiffany blue, this 30in leather suitcase is one of a six-piece matching collection complete with sophisticated Globe-Trotter design. Swap the standard neutral suitcase for this bold pop of color and look stylish wheeling around the jet terminal. Getting some shut-eye while in transit is essential to beating jet lag, so why not do it as cozily as possible? Made from 100 percent pure cashmere, this oh-so-soft three-piece set includes an eye mask and throw blanket packed into a silk-lined bag. Add a personal touch to the jet-ready gift with custom monogramming. 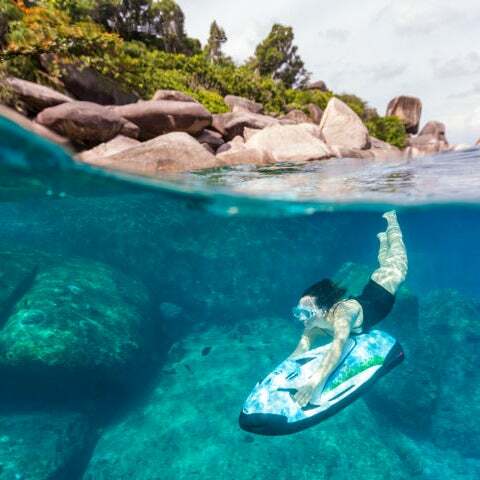 Routes du Bonheur from luxury hotel group Relais & Châteaux affords the adventurous traveler the opportunity to unwrap an itinerary in a box. Accepted at nearly 200 properties in the Relais & Châteaux portfolio, the box represents three nights in a double room and three dinners complete with wine or champagne at three different hotels. From the French Riviera to Basque country, the trip is yours to build. No one knows how to travel with jewelry better than a jewelry designer herself. Tumi tapped Eva Zuckerman of minimalistic fine-jewelry brand Eva Fehren for an exclusive travel collection featuring one-of-kind artwork. We particularly love the leather-clad ring box featuring eight small compartments and one large center compartment, so you can bring all your precious baubles along on your trip. Constructed in brown leather with brass accents and military-stripe detailing, Ghurka’s signature wardrobe trunk provides a nostalgic way to pack your belongings. A hanging rack and twill-lined compartments in various sizes keep your wardrobe organized so unpacking is a breeze. Each trunk is custom made with fine calfskin, selected from the most naturally flawless hides available rather than being pretreated. If you can’t rush to the salon chair after a long-haul flight, it’s essential to have a hair dryer handy. The T3 Featherweight Compact hair dryer is designed with the frequent traveler in mind and features a folding handle and lightweight body. Despite its small, packable frame, the styling tool dries hair quickly thanks to Tourmaline technology. 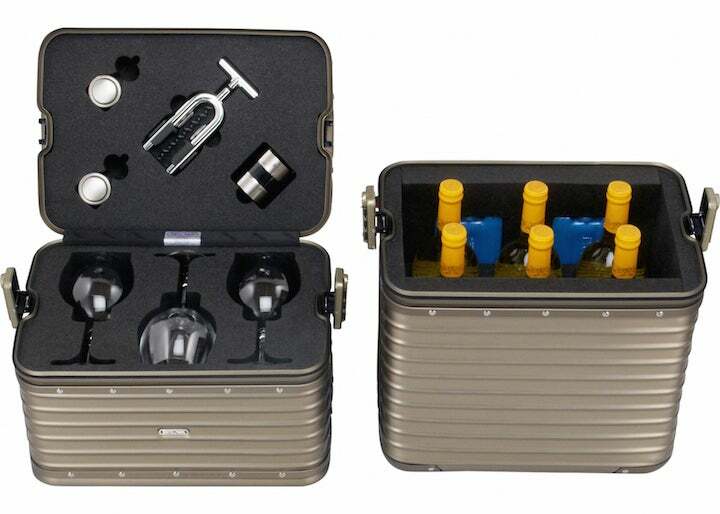 The Rimowa Wine Case is the perfect option for those of you looking for an easy and reliable way to transport your most precious wine bottles. With enough space for six bottles, three glasses and all of your must need wine accessories, this is ideal for travelers with something to celebrate.